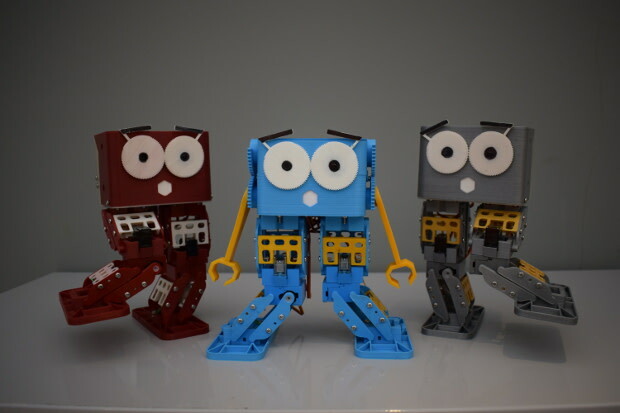 He is designed to be customisable with 3D printed parts, and is also completely upgradeable. He’s is even compatible with single board computers like the Raspberry Pi! Out-of-the-box Marty can be controlled remotely over WiFi, but you can also program him in a variety of programming languages. 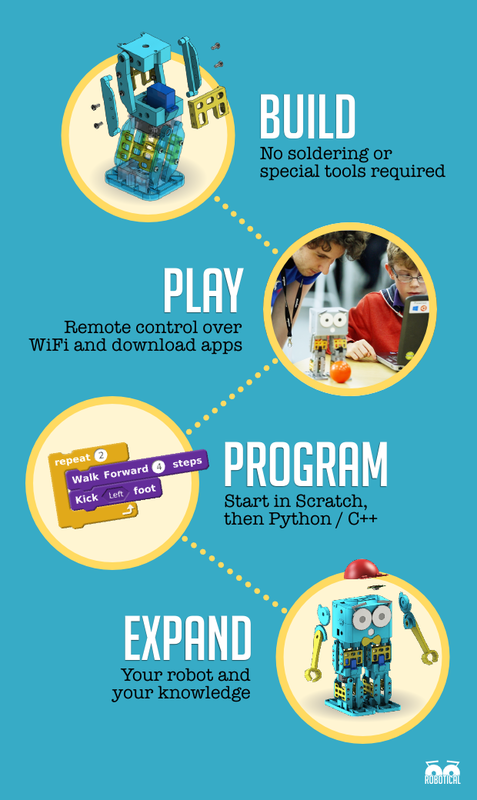 Kids and beginners can learn with Scratch, where coding is as simple as clicking and dragging blocks. 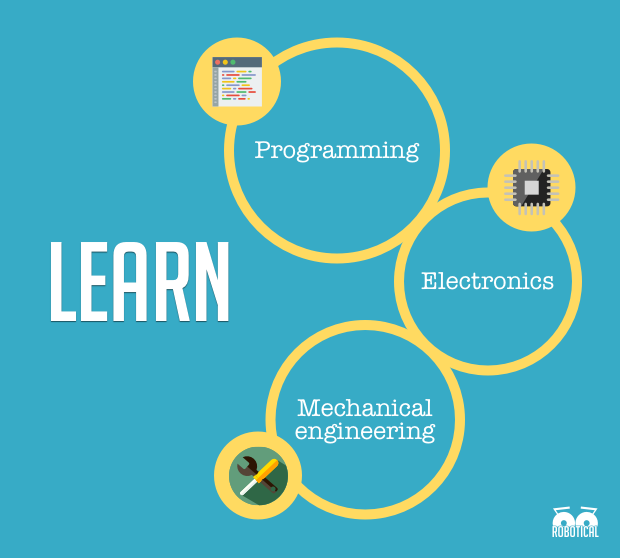 Experienced programmers can control him using more powerful programming languages such as Python and C++, or state of the art robotics tools such as ROS. 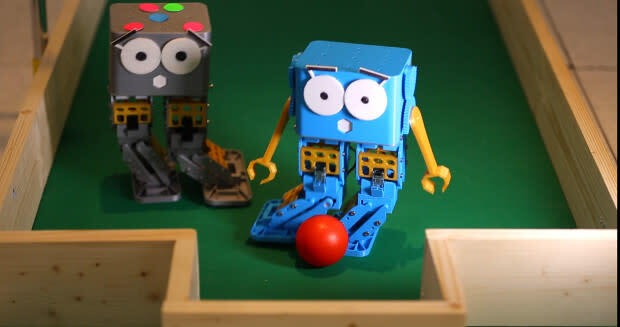 "Could radically alter how children learn about mechanics and computer programming"
"Robotical, a robot to help teach coding, has been hailed as one of the UK's most exciting spinouts"
"Sure there are a ton of other robots made for kids, but Marty is astonishingly special." "I’m probably most hyped about Marty’s eyebrows"
Marty has a unique leg design, which makes him easier to use than a traditional walking robot and gives him a longer lasting battery. He can walk, turn, dance, kick a ball, and - of course - bust out some funky dance moves! 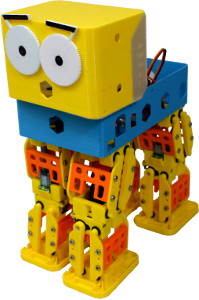 Marty was developed by Dr. Alexander Enoch over the last year and a half originally as a side project during his PhD (for which he was building bigger walking robots) at the University of Edinburgh. We've now got several functional prototypes and we're ready to start producing kits, but we need your support to make it happen! Marty's legs are a bit different to a traditional walking robot. Each leg has three motors: one for forwards and backwards, one for side to side, and one for turning. That's fewer motors than a traditional two legged walking robot, and makes Marty cheaper to make, easier to use, and makes him use less energy to move around. His new design allows him to make all kinds of movements, and gives him a bit of swagger! A spring in his step. We use springs to help support Marty’s weight and reduce the amount of work the motors have to do. He can even stand on one leg even with all his motors turned off! Happy? Worried? Angry? Ambivalent? Marty can show emotions with his moving eyebrows! Getting started programming Marty is incredibly easy. To beginners we recommend starting in Scratch, a "graphical" language where programming is as simple as clicking and moving blocks. Scratch is aimed at ages from 9+ and widely used around the world. 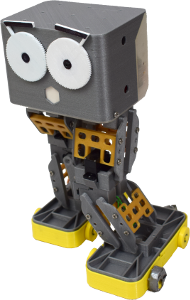 You can make Marty interact with the environment by moving blocks around to read information from his sensors and sending commands back to his motors. When you are ready to go into learning text-based programming, Marty makes the transition as easy as possible by providing the same interface with an extensive and engaging set of guides and tutorials. No previous knowledge of programming is required to program Marty, but if you know what you're doing you can jump in straight away using Python, C++, Java,C#, and many more programming languages! 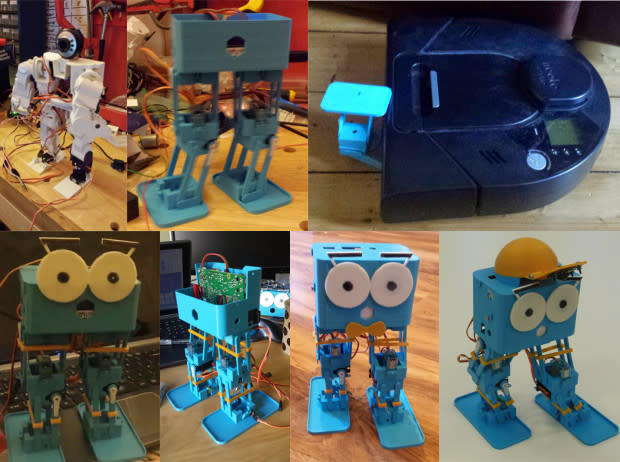 You don't need a 3D printer to get a Marty, but all the plastic parts can be 3D printed, and the CAD files will be available. So if you do have access to a 3D printer you can customise the designs as much as you like. The electronics on board also support additional sensors and motors. 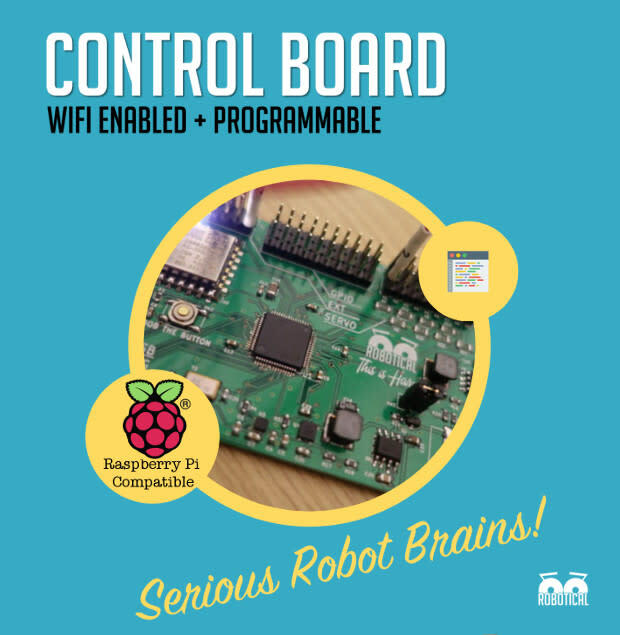 The robot is built to hold a full size Raspberry Pi (a little credit card sized computer), so while it's not required to have one, you can add one and then you have a walking quad-core computer! 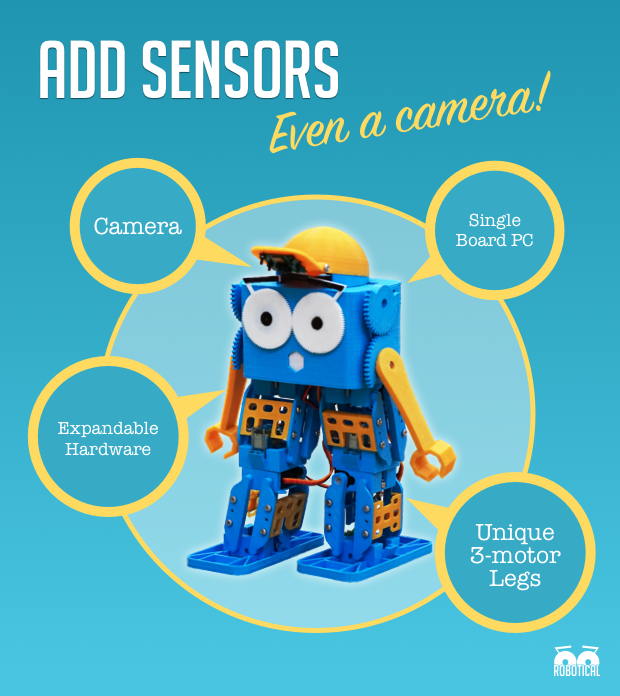 With a Raspberry Pi on the robot you can do things like vision processing all on-board for tracking a ball and playing football, or even detecting faces to make Marty communicate with your friends! Additionally, Marty’s design makes it compatible with all Raspberry Pis, including the new Zero, as well Arduinos, Beaglebones, and other commonly used boards! Robotics is more than just software, and a robot app store isn't a real robot app store unless it also has hardware add-ons. 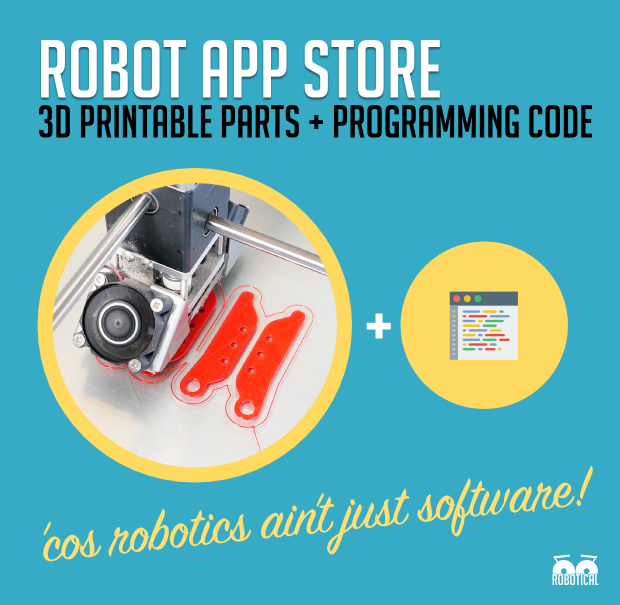 Our app store will let users share 3D printable parts and code for the robots, along with links to any additional parts or sensors the add-on requires. Marty's control electronics are custom made and designed to address a few of the issues we have with other control boards on the market. Based around a 180 MHzARM Cortex M4 micro-controller, the board takes care of all Marty's low level functions, generating movements in real time, reading sensors, and connecting to WiFi. Do I need a 3D printer? Does Marty require a Raspberry Pi? What is a Raspberry Pi and how is Marty compatible? What sensors does Marty have? Can I get some more info on how you program Marty? What's the funding for? How robust is Marty? All the plastic parts to build a Marty - 36 parts in total. Servo motors. To make Marty move. You'll get four metal geared ones for the main drive motors, and three more carbon fibre geared ones for the leg twist and eyebrow movements. Starter batteries. A set of AAs to get you started, but you'll probably want to swap these for some rechargeables (or a LiPo or LiIon pack) once they drain. 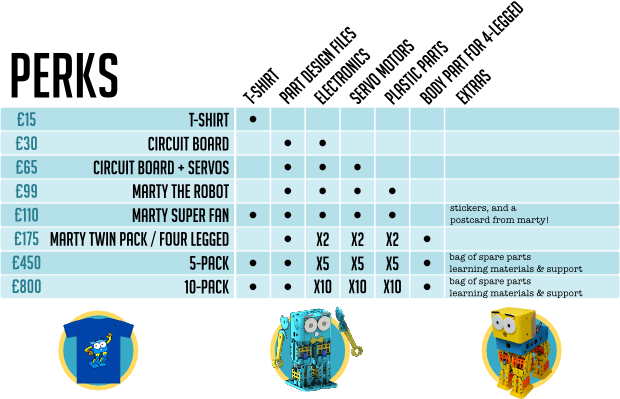 Or, if we reach the stretch goal, Marty will come with a rechargeable Lithium Ion battery, and a charger. Instructions. For the few that still read them, we will make them extra-cute! Well, free for personal use, anyway. The leg mechanism is patent pending, but we only want to use IP protection to try and stop big companies from potentially bullying us - not to stop you guys making cool things. We'll post the files for 3D printable parts online, and you're encouraged to modify and share them. Same for software! Marty is designed to be more than a pretty face. Multiple degree of freedom limbs make a robot that is interesting to control, and with the capability to use sensors like motor current, accelerometers, force sensors, and even camera(s), you can get into some quite advanced topics in robotics - from movement generation to mapping, localisation, and high-level planning. Right now you can program Marty in Scratch, Python and C++, and there will be APIs to simplify issuing commands and reading from sensors. We'll support more languages with time, with precedence given first to popular ones such as Java, C# and a few others more. With a Raspberry Pi (or other single board computer) on board you can do your vision processing for a completely autonomous robot. With a Pi you can even run ROS, the Robot Operating System, on the robot - and we'll provide wrappers to make it easier to interface with the entirety of the robot software. Marty has been in development for a while now, he started off as a side project during Alexander's PhD, but he's come a long way since then!